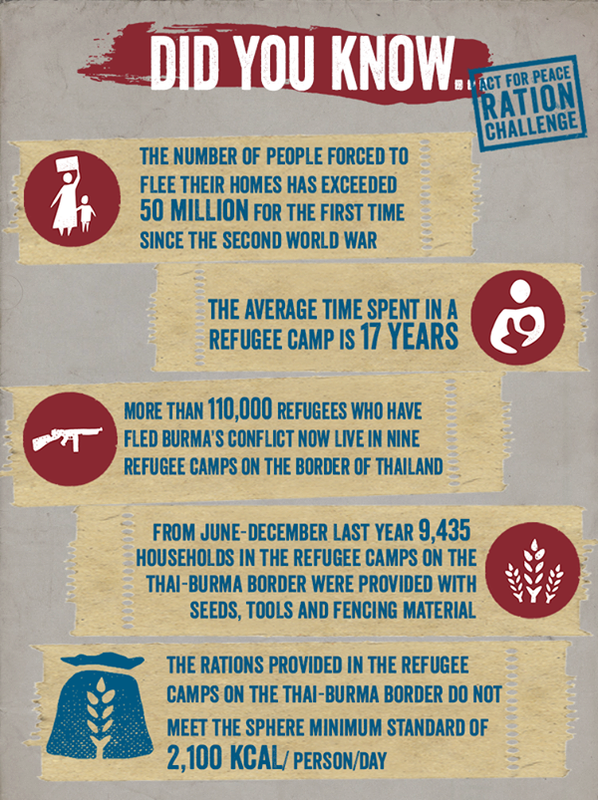 This Refugee Week I am taking part in Act for Peace’s Ration Challenge. 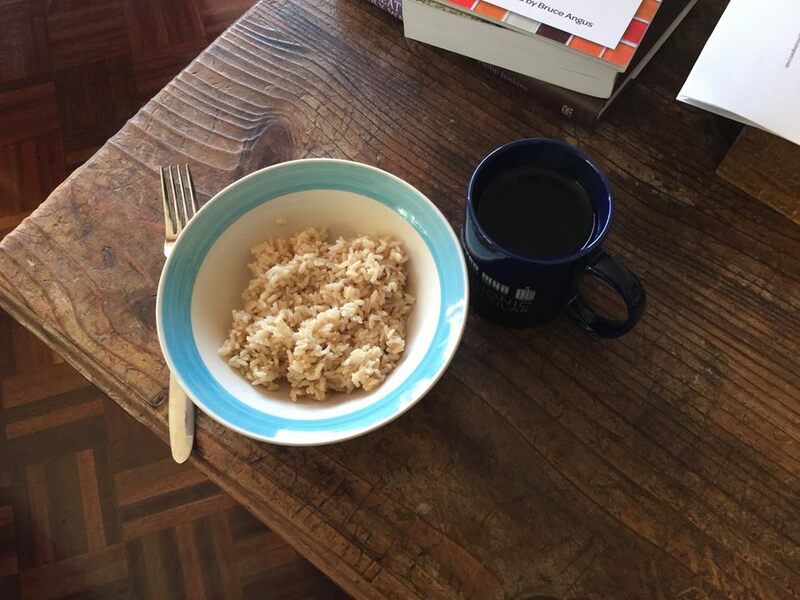 For seven days I am committed to eating the same rations that a refugee receives in Burma. 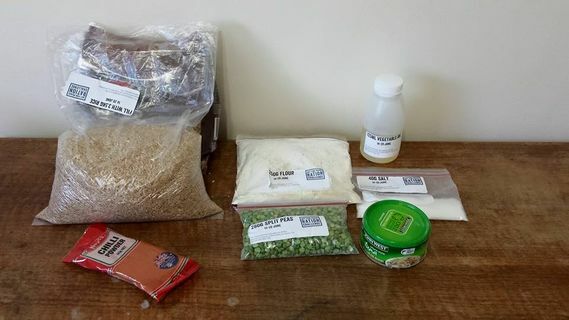 The rations are: 3,500 g of rice; 280 g of split peas; 250 g of fortified flour; 155 g of fish; 40 g of salt and 125 ml of vegetable oil. Because refugees can add to their rations by cultivating a garden we are also able to add supplies that we have ‘cultivated’ by getting sponsorship: $200 raised adds a condiment; $300 adds a serve of vegetables; $400 adds a portion of fruit; $500 adds a serve of protein; and $1000 adds a bonus item to the value of $5. Two and a half days in I am not hungry, or feeling very deprived. But I am feeling a little bored at my lack of menu choice. 3.5 kg of rice over the course of a week is a lot of rice! I had bowls of plain rice for breakfast on Sunday and Monday, and rice fried with chilli for Sunday lunch and dinner, and I am already very, very over rice. So the first thing I have discovered by doing this challenge is how astonishing is the variety of food I am normally able to eat. I don’t simply need to fill my stomach – the food I usually eat is tasty as well as filling. The second thing I have discovered, or rediscovered, is how long it takes to prepare food if all I’ve been given is the basics. On Sunday night I started to make soup with the split peas. Rather than making a single serve of soup, I decided to use half my rations and make multiple serves of soup. What I didn’t realise was how long it takes to break split peas down. In the end I had some more rice for dinner while I waited for the soup to cook – which took three episodes of Doctor Who plus the forty-minute Sunday night ABC news bulletin. It’s been a long, long time since I made soup from scratch, and I just wasn’t prepared to spend that much time cooking. I’m going to appreciate labour-saving foods and devices when this week is finished. But I am quite proud that I am managing to feed myself. 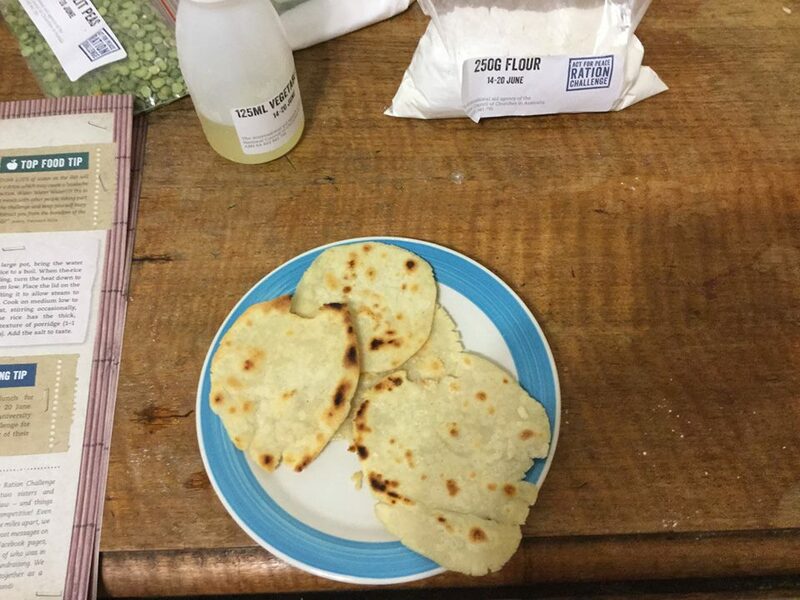 On Monday night I had the soup that I’d made the night before and chapattis that I cooked that evening. The soup was a bit bland but the chapattis were wonderful! 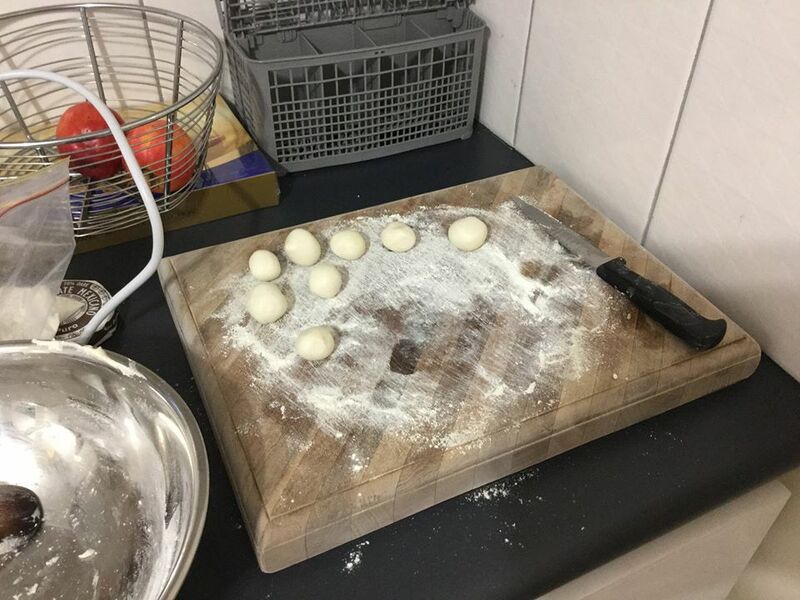 I suppose I didn’t really make them from scratch, the flour had been milled for me, but I still had a sense of achievement. I haven’t been missing coffee as much as I thought I would. I had a horrible headache on Sunday night, and on Monday morning I took a couple of pain-killers (I know they weren’t in the rations, but I was desperate). But now, on Day Three, I’m feeling fine. I have, however, decided not to go for any runs this week. That might just be sheer laziness on my part, but I’m not sure I could resist the post-run temptation to eat a piece of fruit or some vegetables. As I look forward to breaking this ration fast on Sunday I am aware of how minuscule my response to the world’s refugees is. I’m living (mainly) on rice for a week. It’s absolutely nothing! But the important thing is the money that I’m raising, more than $1000 so far. Overall $250,000 have been raised by Act for Peace and that will feed 1157 Burmese refugees for a year. There’s no way I could donate $1000 myself, so I’m excited to have raised $1000 from my kindly friends and relations. If you haven’t donated yet and would like to, go here. And thank you! This entry was posted in Political Activism, Reflection and tagged Act for Peace, Food, Ration Challenge, Refugee Week. Bookmark the permalink.